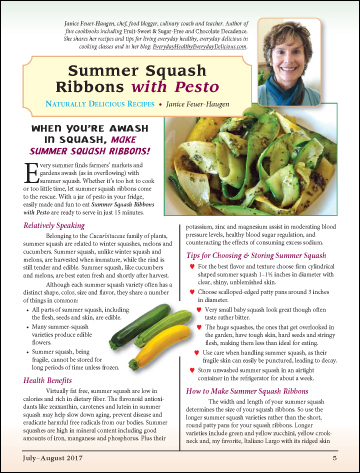 When You’re Awash in Squash, Make Summer Squash Ribbons! Every summer finds farmers’ markets and gardens awash (as in overflowing) with summer squash. Whether it’s too hot to cook or too little time, let summer squash ribbons come to the rescue. With a jar of pesto in your fridge, easily made and fun to eat Summer Squash Ribbons with Pesto are ready to serve in just 15 minutes. Belonging to the Cucurbitaceae family of plants, summer squash are related to winter squashes, melons and cucumbers. Summer squash, unlike winter squash and melons, are harvested when immature, while the rind is still tender and edible. Summer squash, like cucumbers and melons, are best eaten fresh and shortly after harvest.